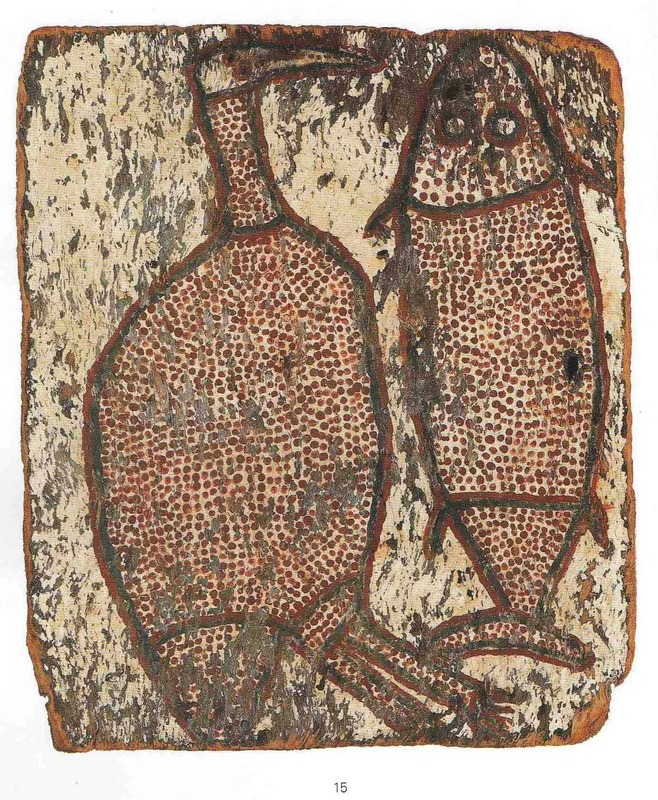 The aim of this article is to assist readers in identifying if their aboriginal bark painting is by Mickey Bungkuni by comparing examples of his work. He painted bark painting in the Wandjina style. Mickey uses traditional ochres and is a recognized aboriginal bark painter and painter of Coolamon. If you have a Bungkuni painting to sell please contact me. If you just want to know what your painting is worth to me please feel free to send me a Jpeg. I would love to see it. Bungkuni was born around 1902 and died in 1978. He was fully initiated and repainted Wandjina in rock shelters. Bungkuni was a senior Wunambai Elder. He lived most of his life in and around Mowanjum and painted sporadically. Mickey was the Uncle or second father of Wattie Karruwara He painted a few barks mainly of his moiety totems the Catfish and Brolga. He painted some exceptional Wandjinas on bark. His paintings are normally on a white background with the figures covered with dense red dots. 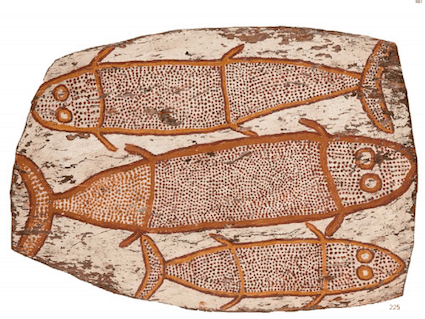 As with many Kimberley artists, the barks that they are painted on are fairly thick and rough. Along with many other Arnhem Land Artists who did bark paintings, there is not a lot of information readily available about Bungkuni. If anyone knows more information about the biography of Bungkuni, please contact me. I would like to add it to this article. The following images are not a complete list of works by Mickey Bungkuni but give a good feel for the variety and style of this artist.